Referee Barry Cook says "there was only one decision to be made" after calling off St Mirren's Championship game against Raith Rovers less than 10 minutes before kick-off. Heavy snowfall between 14:00 and 15:00 forced the postponement. "I'm conscious the ground staff here, almost 100 people, worked really hard this morning to make the pitch playable," Cook told BBC Scotland. "As kick-off neared, everything they were doing was totally undone." 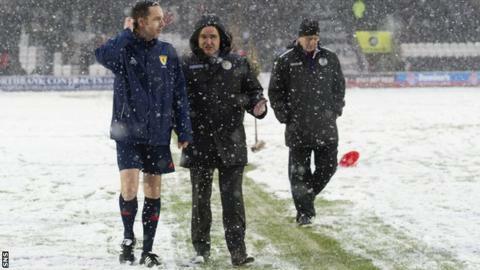 It was one of eight Scottish Professional Football League games postponed on Saturday, with two others being abandoned after kick-off because of freezing temperatures and snow. Cook added that the distance travelled by Rovers fans - including a group of 16 German supporters who had come to the game from Ingolstadt, Kirkcaldy's twin town - to Paisley did not affect his decision. "It doesn't sway us, but we need to be conscious of the efforts of a number of people to make the game go ahead," he said. "It's about the game of football and the players' safety, and the spectators, everybody - a number of factors come together. "As a referee, you're in a no-win situation. "If we'd made the decision this morning to put the game off and there was no snow, I would be the villain and now making the decision so close to kick-off it's exactly the same. "I suppose that's just the life of the referee." St Mirren chairman Stewart Gilmour backed Cook's call to postpone the fixture, adding that Scottish football should make more of the summer months. "We came to the right decision," he said. "The referee has got to look at the safety of the players and he was saying the goalkeepers weren't very comfortable with the snow sticking in their boots and the studs not going into the ground. "I definitely don't think we should be playing in January for two or three reasons - the weather, folk don't have any money. "We should be playing football July, August, September and getting our League Cup finished, having the final in October. This is an entertainment business for the fans."